I offered my Plant Biology students a rare opportunity - extra-credit for botany related jokes. Some of the students pursued this with gusto, and so I have a nice list of botany jokes. Not all good, but still fun. Why are plant capable of consuming cars? 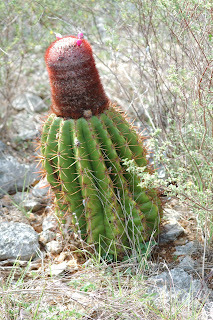 And just for fun, a cactus from Puerto Rico (Melocactus intortus) from Guanica dry forest on the south part of the island, which was my favorite part of the trip.